One of the major mistakes made by the Calories In/ Calories Out (CICO) hypothesis is the presumption that energy is stored in the body as a single compartment. They consider that all foods can be reduced to their caloric equivalent and then stored in a single compartment in the body (Calories In). The body then uses this energy for basal metabolism and exercise (Calories Out). All energy is stored in that one compartment. However, this model is a complete fabrication. It does not exist. This known mis-understanding has led to general acceptance of the CICO theorem. According to this model, by reducing the amount of calories going in, or increasing the amount going out, you may reduce the amount of body energy stored as fat. Of course, this Eat Less, Move More (or Caloric Reduction as Primary) strategy has a known success rate of about 1% or a failure rate of roughly 99%. This does not deter any of the medical or nutritional authorities to question the sagacity of their advice, though. 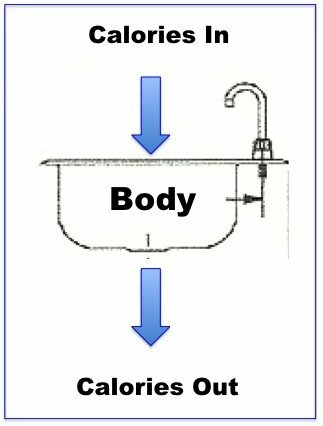 To better understand how energy is stored in the body, it is more accurate to use a two compartment model. Dr. Kieron Rooney’s diagram demonstrates that the body is able to derive energy from 3 sources – glucose (carbs), fat or protein. However, protein is not stored as an energy source and is only used when there is excessive dietary protein after which it is turned to glucose. So, this leaves two potential fuel sources – glucose and fat – and these are stored in different compartments. Glucose is stored in the liver as glycogen – a molecule that is composed of long chains of sugars. This is easily accessible to the body, but there is a limited amount that is able to be stored. After that threshold is reached, the body stores fat. Think of glycogen like a refrigerator. It is very easy to move food in and out of the fridge, but the storage space is limited. Body fat is much more difficult to access, but you may store unlimited amounts. Dietary fat is directly added to the body’s fat stores. Excessive carbohydrates are turned into fat by the process known as De Novo Lipogenesis (DNL). Think of body fat as a freezer that you store in your basement – you can store lots of food in the freezer but it is more difficult to get at it compared to the fridge. You can also store more than 1 freezer in the basement if you need more space. As you eat, the body stores energy. As you don’t eat (fast), the body must take stored energy from the body to burn for fuel. 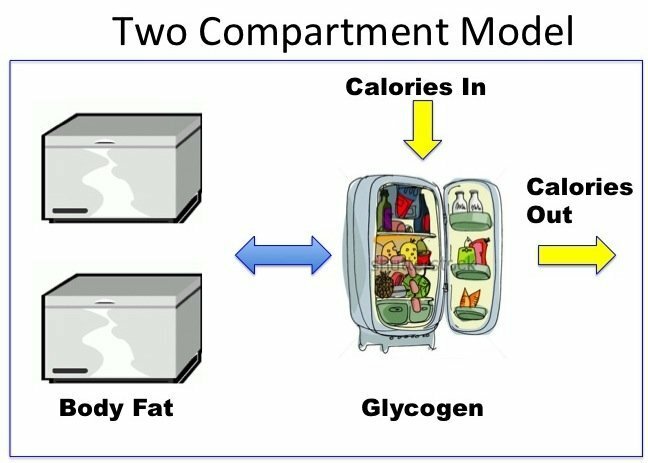 But it does not take equal amount from both compartments (fat and glycogen). 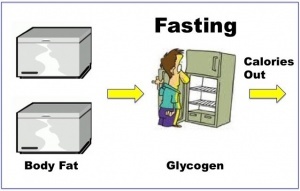 Glycogen is burned almost exclusively until it is finished – this can last 24-48 hours of pure fasting. This is logical since it is much easier for the body to get at the glycogen. Think about it this way. If you buy groceries, you first store it in the fridge. Once it is full, then you start to store it in the freezer. When it comes to taking food out to eat, you start by eating the food in the fridge. Only after almost the glycogen is already burned for energy does the body turns to its stores of fat. Similarly, only when the food in the fridge is gone do you want to go downstairs to that cold dank basement to get the food in the freezer. It takes more effort. You do not burn equal amounts of glucose and fat. For example, if your glycogen ‘fridge’ is full, you will not use any of your fat in the ‘freezer’. If you need 200 calories of energy to go for a walk, you take that exclusively out of the glycogen with none of the fat being burned. The two compartments for energy are not burned simultaneously, but sequentially. You need to empty out the fridge before you can start using the food in the freezer. In essence, the body can either burn sugar or fat, but not both. This is controlled partially by insulin, and also directly by the Randle cycle – described in 1963. This is also sometimes called the glucose-fatty acid cycle. In isolated heart and skeletal muscle cell preparations, Randle and his colleagues were able to show that cells that were using glucose for energy were inhibited from using fat and vice versa without any interference from insulin or other hormones. This biochemical mechanism directly forbids the body from using both fuels at once. You either burn sugar or fat, but not both. 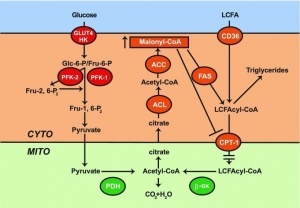 You can see from the diagram that using glucose eventually leads to the production of Malonyl-CoA which inhibits the use of fat (LCFA – Long Chain Fatty Acid). So, why can’t you lose weight using the CICO method? Because it is based on the incorrect idea that all calories are equal. 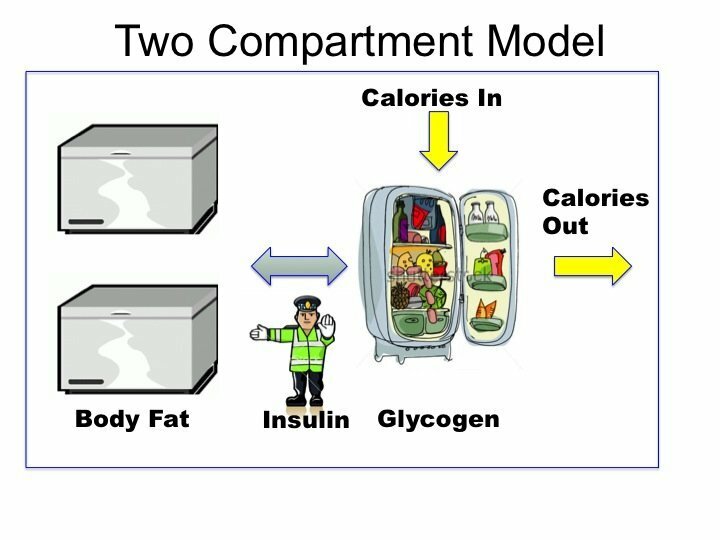 When you store food energy (calories), it is stored as sugar (glycogen) in the ‘fridge’ and fat in the ‘freezer’. But you must burn through the sugar first before you can start burning fat. So, now you want to lose body fat. The first thing you need to do is clear out the sugar in your refrigerator. However, if you are continually filling up your fridge 3-6 times a day with sugar, then you will never start burning the fat in the freezer. The CICO method ignores the two compartment problem and pretends that all calories are stored equally and burned equally (single compartment), even though this has been known to be false for at least 50 years. This is the equivalent of the standard calorie restricted diet of eating 3-6 meals a day with a relatively high carbohydrate (50-60%) content. You imagine that since you are filing up the fridge with less glucose, it will eventually empty. However, this does not happen. Why? Because, as you start putting less food in the fridge, your body senses that and starts to get antsy. So, it starts to make you hungry and want to eat more. If you don’t fill it up, it will decrease your metabolism so that it is burning less energy. What’s the solution? First, you could follow a Low Carb, High Fat (LCHF) diet. By severely restricting the amount of carbohydrates, we keep our glucose fridge empty. Now any energy that must be burned must come out of fat freezer. This essentially turns the two compartment problem into a single compartment problem. Second, you could try intermittent fasting (IF). Fasting essentially burns through all the stored sugars in the fridge quickly. Will you get hungry? Yes, probably. But if you push through that, your body is forced to burn fat for energy. The metabolism does not slow down because of the compensatory hormonal changes of fasting. After several days, hunger is also suppressed – the mechanism is unknown, but likely related to the ketone production. The bottom line is this. You can store energy in the form of sugar or fat. In the fasted state – you can either burn sugar or fat for energy, but not both. If you are continually supplying your body with sugar, it will not burn fat. Fasting provides a very quick way to start burning fat. It provides a solution to the two compartment problem. The reason why the Calorie pundits never understand why their model doesn’t work is because they have fundamentally mis-understood the problem as a single compartment. I belatedly realized that I forgot to add this section. Actually, it didn’t update, so I thought it was in here but it actually wasn’t. Sorry. It’s well known that insulin inhibits lipolysis. That’s a fancy way of saying that insulin stops fat burning. Well, that’s normal. Insulin goes up when you eat, so it tells the body to start using the incoming food energy and stop using the fat in the freezer. So, if your insulin is high from insulin resistance, you may find that your body is not able to get at the fat in the freezer. So, as you lower the incoming calories (Caloric Reduction as Primary strategy – Eat Less) your body is unable to get any fat to burn. So it compensates by reducing caloric expenditure. Hence basal metabolism falls. If you are 8 years old, your insulin resistance is minimal and fasting insulin is low. That means it’s really easy to get at the fat in the freezer. It’s like the freezer is right beside the fridge. Easy Peasy. So, if you simply reduce calories, your body can easily compensate by getting some fat out of the freezer. This explains the time dependence of obesity. That is, those that have been obese for a long time have a much, much harder time losing weight. Because their insulin resistance is high causing elevated insulin levels all the time. THAT made sense! I can’t wait for the book. Dr. Fung allows bone broth during a fast. I had tried sipping bone broth during a fast. But it only made me hungrier and more difficult to fast. Black coffee however, helps to reduce my hunger pangs v easily. Jesse, it actually does but to a far lessor extent than do simple carbs, complex carbs, and protein. Somewhere Dr Fung did a jpeg on that. The general rule of thumb for breaking your fast is that 50 kcal breaks it. A few days ago I found your site , listened to lectures on yt and I love it! You will save the lives of many people who have lost hope that recovery is possible. I am very grateful, thank you very much. Blessings. You are not missing anything, you said it yourself: “due to low levels of insulin”. The way it works in normal people is the way you described. However, many people that need to lose fat, have very high levels of insulin. Me included, after many months of LC my insulin is still over the upper “normal” level (which is not normal, as we now know). This high insulin will not let you access the freezer much. This high insulin will make you need to exhaust the glycogen store before slowly turning to the fat store. Isabela, the answer to your problem is *fasting*. Low-carb is not enough, because proteins also stimulate insulin production, along with the lower carbs. You have to starve the body completely to make the insulin lower. Also, fasting means fasting. Too many people are talking about 14-hour and 16-hour “fasts”, or are finding reasons to eat during fasts. The best compromise is 24-hour alternate-day day fasting. As time passes, your body weight will decrease, as fat is burned off. At the same time, insulin sensitivity will improve, as the body benenfits from sustained periods with low insulin levels. Insulin goes up as soon as we eat. For non-diabetics glucose will go down and insulin will follow. For diabetics (insulin resistant) glucose will linger in the bloodstream and insulin will stay high until glucose goes away (long time). Next meal has to be when glucose level is low, otherwise insulin will be high all the time. This is my understanding of diabetics problem. I wonder if the fuel mix occurs in separate organs for example muscles running on glycogen with the heart running on fatty acids or similar. At rest I oxidise 70% fat, 15% protein and 15% carbohydrate according to respiration analysis. When I started reading this, I thought the two compartments were going to be visceral and subcutaneous fats. I’m glad, however, to learn about this logic mistake CICO rests on. Visceral is usually the first to go which is a good thing as it is metabolically more active than subcutaneous. In general visceral is more vascular and contains a higher % of large adipocytes plus having more glucocorticoid and androgen receptors than subcutaneous. Meaning it is very much easier for visceral fat to release fatty acids once your insulin is under control. As subcutaneous is less vascular than visceral and compared to visceral it is much more susceptible to vessel constriction to conserve body temp which can further limit lipolysis. Excellent news about the visceral fat going first! Apparently, that is the most dangerous type in metabolic syndrome. I like this analogy. I’m curious though about the very small percentage of people that DO lose weight on a high carb/low calorie diet where they don’t fast and aren’t in ketosis. How you you describe their weight loss with the fridge/freezer analogy. Are they constantly going back/forth between glucose/fat burning? Or are their glycogen stores not filling up and during the long overnight fast is where they are losing fat, a little at a time? They are mostly part of the 99% or athletes. You can lose weight on many kinds of diets, but 99% gain it back in the long run. Or are young. Or have the very rare near-perfect metabolism. Dianne, I don’t think so, if you’re eating a low carb, high fat diet. You’ll already be burning fat when you begin to fast. I’ve done a few 5-day fasts, a bunch of 3-day fasts, one 2-day fast (just finished this one), and many other types of fasts (typically, I no longer eat breakfast and sometimes don’t eat breakfast or lunch). I’ve tried IF and it turns me into a raging lunatic. I do not do well. I have read that fasting is different for women because of hormonal differences between men and women. I have also tried keto (never can get my electrolytes right I think) and plain low carb. I am on a break from low carb because after three weeks my energy was still very low and my moods. Oh my moods. Very unstable. So, my question is, what mechanism might be at play that I am unable to do even low carb without disastrous effects? This is the clearest explanation of this I’ve ever seen. Thanks for this! Would fasting lead to adrenaline rushes at night and difficulty sleeping as a result? Also, what do you when you’re fasting and need to take medications, vitamins or supplements that require being taken with food? But wondering… You just don’t do any carbs? How does one do that? Also do you not feel faint when you fast? I think artificial sweeteners also raise my insulin levels. That would explain why drinking diet soda makes fasting insufferable. I can fast without issues for days, but as soon as I drink a diet coke, an hour later I start feeling sluggish and very hungry (even though hunger was near nonexistent just an hour before). I guess it has something to do with the pancreas reacting to flavor? It makes sense too, cause increased insulin lowers my blood sugar way down, not knowing there is no actual glucose being added to my blood circulation, and that increases hunger. OMG… Kelly and I aren’t differentiated in this thread!! How to do that? I get really confused about muscle loss in all of this. I went low carb while marathon training and ended up losing 4 lbs of muscle. It seems I have to eat carbs but if I want to lose weight I can’t. There must be a way to do this without wasting muscle. I have been just eating carbs before and after my workouts and I lost some weight but I’ve been stuck now for 3 weeks and just can. Drop any more. I’m scared to drop more carbs for fear that I will just lose muscle. How sure you losing muscles? It’s more certainly water and glycogen stored in the muscles. I have the same problem of muscle loss during fasting & end of fasting week. I am also confused on how to regain lost muscle mass as it may jeopardise the efforts to combat insulin resistance if I increase caloric intake with protein. We request Dr.Fung to guide us meantime if any other member has any insight please post your experiences & suggestions. Dr. Fung’s book, The Obesity Code, in the Toronto news. Karen, What do you eat when you are on your “fat fast” days. I would love to know. Jo, I eat healthy fats, especially avocado, walnuts, flax meal, olives and olive oil, and hemp seeds. Dana Carpender has a small book called “Fat Fast” with 50 recipes that are helpful. But that said, I find that it is much harder to eat this way, even for just a couple of days, than it is to simply fast for two days a week and then eat LCHF most days. This is not meant as a challenge but stems from confusion. How can the very obese lose massive body fat on juice fasts or otherwise consuming copious fruits? The Calorie Reduction method technically works so only getting a couple hundred calories a day in juice will let you lose weight, the problem is the sugars in the fruit keep your body producing insulin meaning you get all the downsides of the traditional diet like constant hunger, mood swings, and your body set weight doesn’t actually change so you put the pounds back on easily. Rather a luxury problem soved…. In March 2013 my husband invited me to a cruise. Wow wonderful but….my dressy clothes didn’t fit anymore and I didn’t want t o buy a bigger size for this occasion, so…I HAD to lose weight! Google gave the solution and I found Zoe Harcombe and dietdoctor. Three months later I fitted in my long skirt and “old” cocktail dresses. Not bad for an 80 year old! Another very clear and informative article. Many thanks, Dr. Fung. when to burn body fat and when to burn fat that comes from food? As it seems to me, if the fat consumption is regular, there’s no reason to get to the “basement” for energy. Dr. Fung, I’m confused about this. Is it as simple as that? After watching and reading everything on this web site, I was under the impression that eating fat is not fattening per se. This sentence is raising questions in my mind about the manner in which fat is metabolized. Maybe you could write a post about the metabolism of dietary fat? Actually even I have the same doubt.. All this while, I thought dietary fat doesn’t make me fat. Only insulin does that. Let’s not forget, if the total energy expenditure (TEE) your body needs for the day is 2400 k/calories, then you can’t expect to eat 3,600 calories of fat per day and lose weight…. Right? hi, I lately read a paper “Kevin Hall -Calorie for calorie, dietary fat restriction risult in more body fat loss…” CelMet 22-3 sept 2015 that seems to disagree with insulin hypothesis. What do you think about ? The first point was probably not clearly expressed. The tie-in would be the concept of ‘weight set-point’. However how this re-set could happen (assuming it is possible?) it is not clear to me. Regular exercise? Long-term IF/LCHF? Both? I am wondering if eating only when BG is lower than personal A1C (average BG), and eating Low Carb so the glucose does not go high again and insulin too (basically eating from the low insulin index foods) would lower in time the Weight Set Point. Theoretically this method will continuously lower A1C through fast (eating only one has low BG) and low carb. What do you think of the Lemonade Cleanse? It makes a lot of sense. However, why did I lose more than 30 pounds with calories in/out method? Not saying fasting doesn’t make sense, I just don’t understand why discrediting the method if it worked for me. I am sure I am missing something. “But you must burn through the sugar first before you can start burning fat.” As a simplistic explanation this makes a lot of sense, but if taken literally, it’s obviously false. Blood sugar drops to 0 before any fat oxidation kicks in? You’d die first. Clearly it’s not a step function as this quoted sentence implies. It must be a sigmoidal function, but the shape parameter (Hill coefficient) governing it would be really interesting to know, and even more, what factors affect the shape parameter? 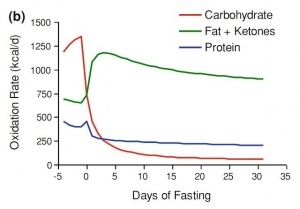 I’m confused by the -5 days fasting on the Oxidation rate /Days fasting Graph. Can someone explain? How often should fasting insulin level be checked if initial level is very high? If the body starts to burn fat only after the glycogen stores in the liver are depleted, that is, after around 24 to 48 hours according to this article, then only after such amount of time into fasting will the body resort to burning fat? If true, then before 24-48 hours no fat is burnt, kinda like makes no sense to fast less than what it takes for the body to actually deplete the livers’ glycogen stores? I don’t know why so many alleged experts insult our intelligence by simplifying the situation and telling us that the body can only burn fat or glucose. This may be correct on a cellular level, but even in ketosis we are burning small amounts of glucose, and even with high insulin levels we are burning small amounts of fat. There are shades of grey in between. For example, even if sugar burner will burn about 5050 fat and carbs during moderate intensity exercise. It is so important not to simplify the facts. You lose all credibility when you do.